Simthembile Yuku is a student at Walter Sisulu University (WSU), where he’s working on the final project for his Honours degree in Computer Science. He’s also one of Root’s private beta users, and built an MVP of a bursary app for WSU students in December last year. 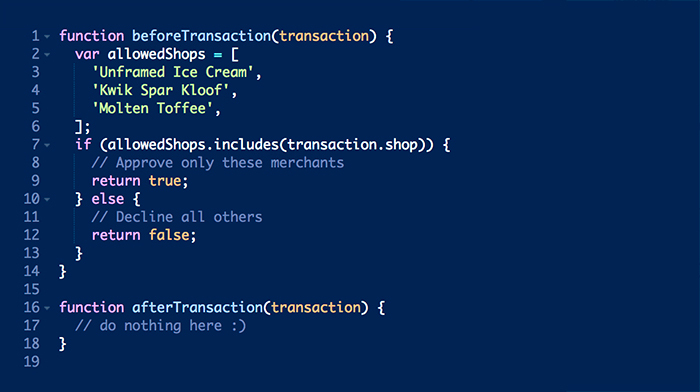 Root is an OfferZen project that aims to open up the world of financial services to software developers. It’s currently operating in private beta, but Root will soon launch an open and programmable lightweight bank account. 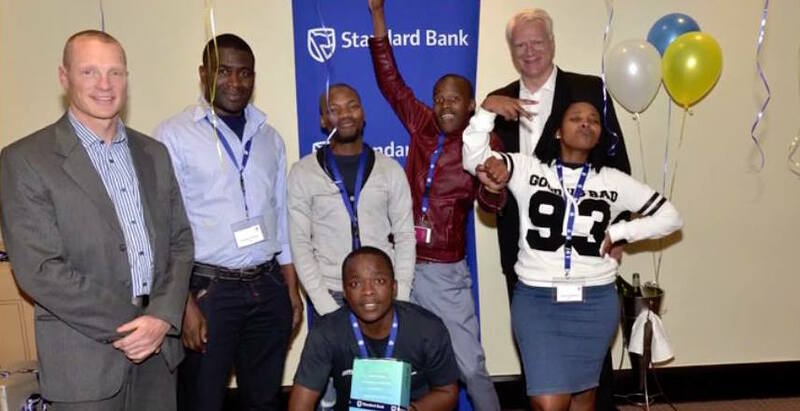 We met Simthembile at the Standard Bank IT Challenge in August 2016, where teams from universities all over South Africa were challenged to build an Amazon Echo app relevant to the fintech industry. The team from WSU won the innovation prize for their app, which helped banks manage queues in their branches. After taking part in the IT Challenge, Simthembile founded the WeCode society at WSU. The group is made up of first year to honours students, and functions like a meetup, getting together every Friday afternoon. Members take turns to present on coding topics they’re interested in. “The aim is really to create a space to share knowledge, learn from each other, and get people excited about Computer Science. Many first year students at WSU don’t know how exciting this field is,” Simthembile says. The OfferZen team loved WeCode’s knowledge sharing initiative, and to support Simthembile’s project we sent startup and tech related books to the key members. In December, Simthembile came to Cape Town for a one week internship at OfferZen. Root co-founder Louw Hopley invited him to the Root private beta, and Simthembile quickly noticed its potential for a problem faced by WSU’s bursary office. The next day, Simthembile made a number of phone calls to verify and refine his idea. He spoke to bursary students he knew, WSU’s SAICA bursary organiser and representatives of the accounting department to get a better understanding of how bursary payments to students work. After the initial market research, Simthembile was keen to start working on a minimum viable product (MVP). The program would allow students to receive their monthly bursary allowance into a Root account, linked to a Root payments card. Students would be able to use their cards only at certain merchants, like specific bookstores and grocery stores, but not at liquor stores, restaurants and bars. The program would also categorise students’ spending (in categories like food or books, for example) and allow students to keep track of it throughout the month. 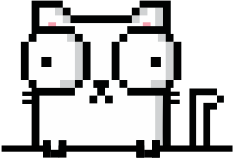 Simthembile wanted to use RootCode to emulate the behaviour of the 3 physical cards in code. This would mean that instead of multiple cards, a single Root card could be used, and the system could be updated dynamically. To build the technology prototype, Simthembile used Root’s online interface and wrote the RootCode for it. The prototype allowed his Root payment card to be merchant specific. 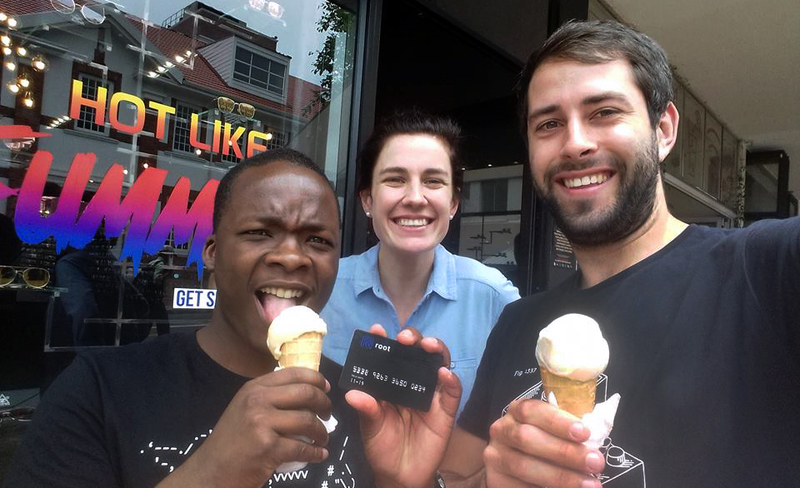 To test it he programmed the card to work at the ice cream store across the road but not at any other merchants. It worked! He was able to buy ice cream with his Root card, but when he tried to use the card at a liquor store, the transaction was declined. With the core part of the concept proven, Simthembile focused the last two days of his internship on finalising the MVP. This included a mobile app for bursary students to keep track of how they’re spending their bursary money, allowing them to manage and plan their spending throughout the month.